These pictures are from our trip to Jordan and Egypt in November 2007. 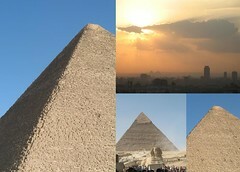 The pyramids at Giza were beautiful. The tourists and buses surrounding the pyramids detracted slightly from the atmosphere, but on the other hand, it was nice to see that people are still allowed to touch them. Apparently they really were built to last; despite the graffiti and vandalism, they are still standing strong.